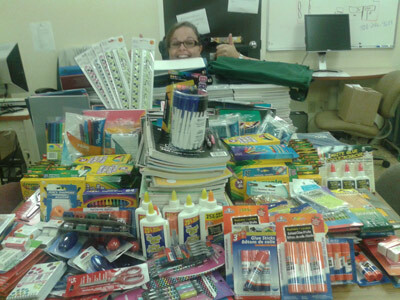 For the second year in a row, Rocmaura Nursing Home’s wellness committee and UNB Saint John’s Information Services and Systems team collected much needed school supplies over the summer months for the Promise Partnership. As a direct result of the sheer volume donated, students from Hazen-White St. Francis (HWSF) and Lorne Middle School received six boxes jammed full of items needed for the school year. The Promise Partnership has invested its efforts, working closely with a growing number of partners, in the future leaders in two of Saint John’s priority neighborhoods. Working closely with the principal, teachers, and staff at the school, HWSF students are assigned a UNBSJ student mentor to help reinforce, and support, academics taught in the classroom. In addition to programming that takes place at HWSF, a high school tutoring program is offered on the UNBSJ campus to former graduates of HWSF and Lorne Middle School two evenings each week.